Prototype: Siemens Vectron electric locomotive as the EuroSprinter ES 2007 class HLE 18 and 2 NMBS/SNCB bi-level cars. 1 type M6 A bi-level car, 1st class and 1 type M6 B bi-level car, 2nd class. Model: The Vectron locomotive and the bi-level cars are based on the prototype. 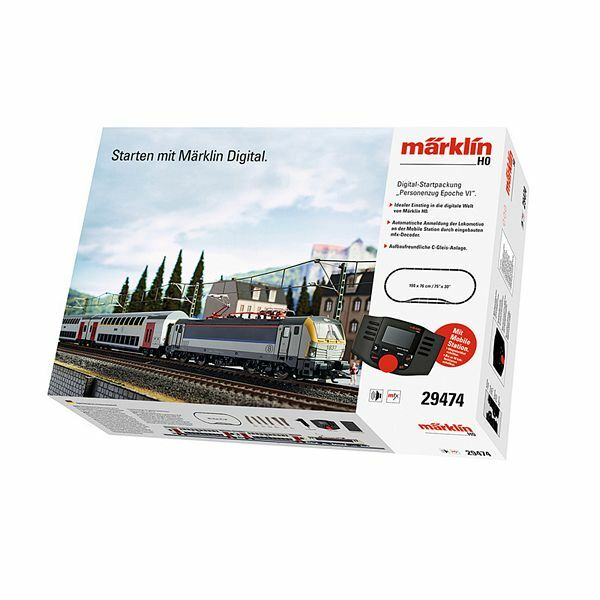 The electric locomotive is constructed of metal and has an mfx digital decoder and extensive sound functions. It also has a special motor, centrally mounted. 4 axles powered by means of cardan shafts. Traction tires. The triple headlights and dual red marker lights change over with the direction of travel, will work in conventional operation, and can be controlled digitally. The headlights at Locomotive End 2 and 1 can be turned off separately in digital operation. When the headlights are turned off at both ends of the locomotive, both ends will have the double "A" light function on. Maintenance-free warm white and red LEDs are used for the lighting. The locomotive has two mechanically working pantographs (no power pickup from catenary). The bi-level cars have tinted side windows. Train length approximately 75.4 cm / 29-11/16". Contents: 12 no. 24130 curved track, 5 no. 24188 straight track, 7 no. 24172 straight track, 2 no. 24224 curved track, 1 pair of no. 24611 and 24612 turnouts. A track connector box, a 230 volt / 36 VA switched mode power pack, and a Mobile Station are included. An illustrated instruction book with many tips and ideas is included in this set. 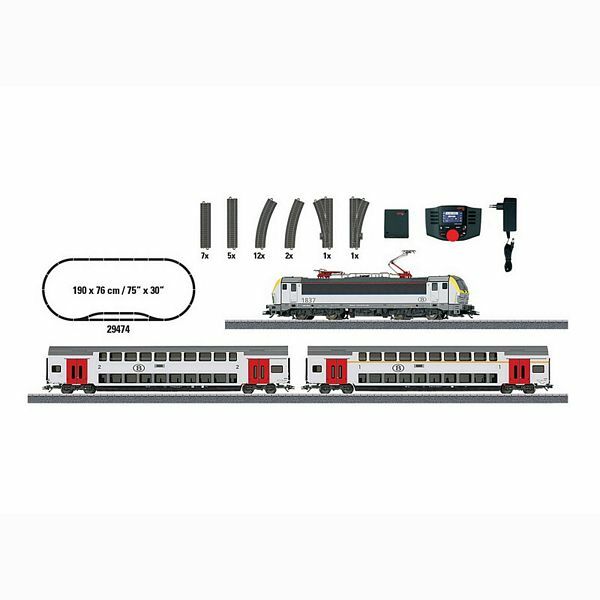 The set can be expanded with the C Track extension sets and the entire C Track program.